LUCY BURDETTE: You know by now that I have a weakness for both debut authors and foodie mysteries. So I'm delighted to share this guest post from Tina Kashian--can't wait to dive into her new series! TINA KASHIAN: I want to thank the Jungle Red Writers for inviting me to blog. I’m excited to be here! 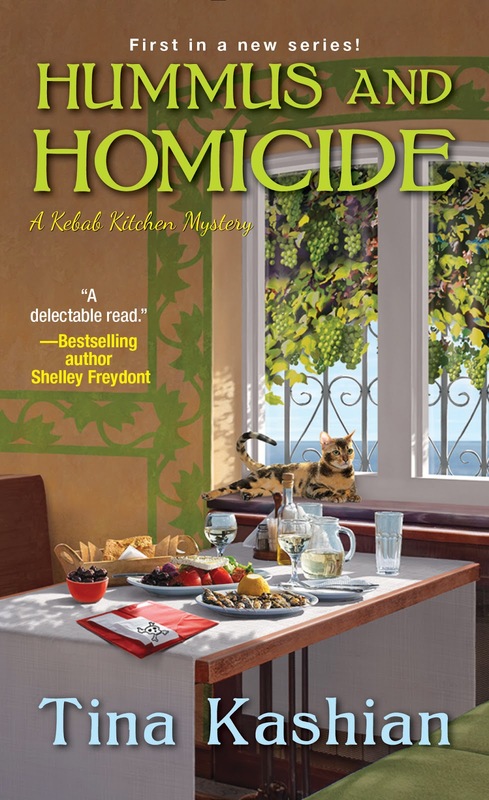 As writers, we’ve all heard the saying “write what you know.” I took this to heart when I began writing Hummus and Homicide, the first book in my Kebab Kitchen Mystery series. I grew up in the restaurant business where my Armenian-American parents owned a restaurant for thirty years in a small South Jersey town. I worked almost every job—rolling silverware and wiping down tables as a tween, to hosting and waitressing as a teenager. My mother was a talented cook and the grapevine in our backyard was more valued that any rosebush. I’d often come home from school to the delicious aromas of simmering grape leaves, stuffed peppers and tomatoes, and shish kebab. Here’s a picture of our backyard grapevine. During the season, it produces purple grapes and hundreds of tender leaves. The leaves are used to prepare stuffed grape leaves. But growing up in a family restaurant definitely had its pros and cons. As one of the owner’s daughters, I’d often get last minute calls from my father to waitress or hostess when another worker was sick. I used to grumble about it, but I always showed up. Family came first. But there were plenty of great times too. The restaurant was located in the same town that I attended high school. Many high school kids worked their first job at our restaurant. Now, this was tricky for me. As a freshman, there were several good-looking juniors and seniors working for my parents. I was shy, very shy. This took some getting used to, but I eventually managed to gain confidence. I met and dated my first boyfriend, a busboy, at the restaurant. My tips paid for my prom gown. My Kebab Kitchen Mystery series also takes place at the Jersey shore. Ever since I was a little girl, my parents vacationed at there. We now have two young girls, and we still take them to the Jersey shore every summer. As I wrote the books, I pictured my fictitious small town of Ocean Crest at the Jersey shore. The name is a combination of Ocean City and Wildwood Crest—two of my favorite New Jersey shore towns. As I wrote the scenes, I heard the seagulls squawking and pictured them circling above the beach. I felt the lapping of the ocean waves and the sand between my toes, and imagined the brilliant Ferris wheel on the boardwalk pier. I pictured myself in Ocean Crest—minus the murders, of course! Writing what you know makes it easier too. Some of my favorite scenes are straight from my memories—temperamental chefs, busy busboys, and gossipy waitstaff can be quite entertaining. The aspects of the murder, on the other hand, I did have to research. Thankfully, I have no experience poisoning a person. I also had great fun coming up with titles. Hummus and Homicide, Stabbed in the Baklava (9/18), and One Feta in the Grave (2/19). All the titles are puns on food and reflect the light and funny feel of the cozy mysteries. Things are slow in the off-season in this Jersey Shore town, but Lucy doesn’t mind. She doesn’t even mind waitressing at the Kebab Kitchen. Her parents have put in a new hummus bar, with ever flavor from lemon to roasted red pepper. It’s fun to see their calico cat again, and to catch up with her old BFF, who’s married to a cop now. This is my own secret recipe and I make it weekly at home for the kids and the husband. It can be served as a dip with wedges of pita bread or vegetables, and goes well with broiled or grilled meat. It can also be used as a healthy alternative to mayonnaise on sandwiches. Please message me on Facebook and let me know if you enjoyed the hummus! Now for the readers. What is your favorite type of cuisine? Italian, Indian, Chinese, Mediterranean, or American burgers? Please share! One commenter will receive an ebook of HUMMUS AND HOMICIDE when it’s released on 2/28. 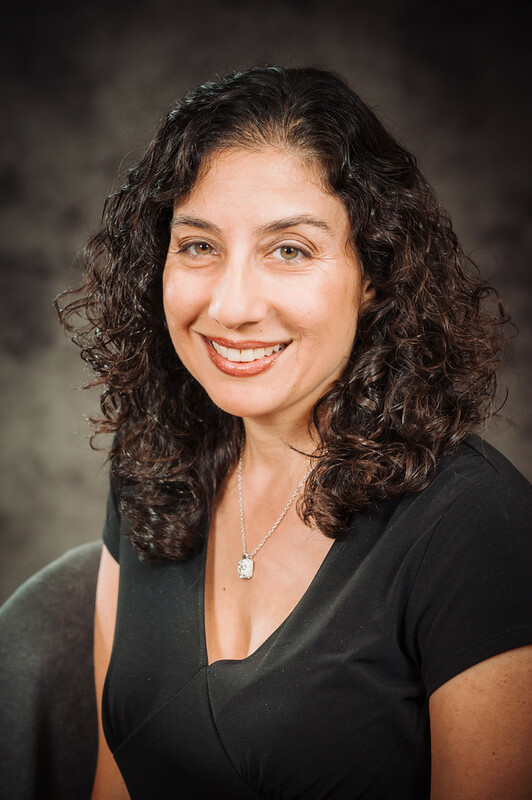 Tina Kashian is an attorney and a former mechanical engineer whose love of reading for pleasure helped her get through years of academia. Her law cases inspired an inquiring mind of crime, and since then, Tina has been hooked on mysteries. Tina spent her childhood summers at the Jersey shore building sandcastles, boogie boarding, and riding the boardwalk Ferris wheel. She also grew up in the restaurant business, as her Armenian parents owned a restaurant for thirty years. Tina still lives in New Jersey with her supportive husband and two young daughters. Please visit her website at www.tinakashian.com to join her newsletter, receive delicious recipes, enter contests, and more! Congratulations, Tina . . . your new series sounds, well, delicious. I’m looking forward to reading your stories and meeting the Berberian family. [And to trying the hummus, thanks for the recipe]. I don’t think I have one “favorite” cuisine . . . there are so many wonderful dishes to try. We eat pretty simply, so when I cook, I generally make Italian or American or Japanese, but I’m not opposed to trying new dishes as long as I have a reliable recipe as a guide. Thank you Joan! I also love Italian food, and often try new dishes. I'm certainly not creative every night. I have two kids and we are often running to activities and eating as we go. I was lucky enough to get an ARC of this book. Still need to actually write the review, but I enjoyed it. Be on the look out for it when it comes out in two weeks. Hi Mark! Thank you for your kind words. I'm glad you enjoyed the book and I'll be on the look out for your review. Thanks again! As a Jersey girl by birth I have great memories of the shore - Lavalette and Wildwood Crest were two favorites. Your description put me right back on the boardwalk. Seafood is my favorite, in all of its guises. Your hummus recipe will definitely be in my arsenal. Hi Kait. I love Wildwood Crest! We plan on visiting this summer for what they call "beach blast." It's a soccer tournament for kids on the beach, and it's a lot of fun. I hope you enjoy the hummus! I grew up 20 minutes from the beach on Long Island, and I love the memories you've sparked. I hope I win. Good luck with the book and series! Hi Barb. I hope the book reminds people of the beach. I have a lot of fond memories visiting the boardwalk as a kid. Thanks for your comment! Congratulations on the book sales! And the hummus recipe sounds delicious. I like to try different cuisines, so it's hard to say which is my favorite. Not a lot of Mediterranean restaurants in my area, and I'm a good long way from the fresh seafood on the coast, but I've enjoyed both when I get the chance. Around here in Dallas we have tons of great Tex-Mex, lots of good BBQ, and some excellent Italian, plus beef any way you might want it. It's our version of eating fresh and local. That's what makes travel so much fun, right? You get to sample the local flavors. Hi Gigi! I enjoy Tex-Mex, and it's my husband's favorite. Of course, we also love a good steak. We usually go to a good steak house on our date nights without the kids. Thanks again! Congratulations Tina on your first book. I love making my own hummus and my recipe is very similar to yours. I am an eclectic eater so it is hard to choose a favourite cuisine. I really like all kinds of Mediterranean cuisine so I will pick Greek as my top choice. Hi Grace. I enjoy making my own hummus. You can also add whatever flavors you like best, like extra lemon or garlic. It always tastes better than what you can purchase at the supermarket. Thanks for commenting! Your series sounds so fun, Tina. Congratulations! Like Grace, I also make hummus with a similar recipe. I'll eat any international cuisine that's prepared well! Oh, and welcome to Kensington - it's a great publishing home. Hi Edith! Thank you for your well wishes. I'm excited to be with Kensington. I'm also happy to hear that you make your own hummus as well! ONCE I made my own stuffed grape leaves starting with actual leaves... and they were fabulous. The ones you get in most/virtually all restaurants these days tastes like mush, both the filling and the wrapping. I just love good food. Chinese, Mexican, Cuban, Japanese, French, Italian, Armenian, Thai, fish 'n' chips, pizza, hamburger: if it's good, sign me up! Mediocre food: Feh. A calorie is a terrible thing to waste on food that doesn't taste good. When I worked in Cambridge we used to go to a Shawarma stand and I fell in love with the pickled radishes that they layered in the wrap. How hard can that be to make? Tina? Hi Hallie! I loved growing up in the restaurant business. I miss it now, and wish we still had it for my kids to experience. It took several attempts, but we managed to transplant my mother's grapevine into our own backyard after she passed away. Every year that it 'blooms,' it reminds me of her. It's the one in the picture you see. It's a special variety of grapevine, and the leaves are very tender. I also enjoy lots of different types of food, and I love your saying, "A calorie is a terrible thing to waste of food that doesn't taste good." Picked vegetables, like radishes, are not hard to make. You need to add the vegetables in a large glass jar with the spices for a time. I'll have to share the recipe on my website one day. Thanks for your lovely comments! I'm not sure I have a "favorite" ethnic cuisine, but I do know when I'm looking for something comforting, I will generally go for Italian. Hi Mary. I like Italian too. Eggplant Parmesan is my favorite. I've made this at home, but it is never as good as my favorite Italian restaurant. I'm going to keep trying! Hi, Tina, and thanks for the recipe. Hummus is my go-to snack food, and I will definitely try this. We are lucky to have a very good Mediterranean restaurant near us, and I'm crazy about their menu. Everything is of such high quality. However, I've yet to find a cuisine I don't enjoy, so I'm always ready to try some new taste, especially if it's made from great ingredients and well prepared. I'm with Hallie: why bother with mediocre food? There is so many amazing foods to eat that are wonderful. My chiropractor grew up on the Jersey shore, and her family still has their restaurant there. Every summer she leaves her husband (also a chiropractor) and spends a month helping out during the busiest part of the season. Their kids have also grown up doing the same thing. Hi Karen! Yes, I agree that fresh ingredients make a huge difference. I try to use what's in season, but the winter months can be difficult. That's interesting about your chiropractor. It must be fun to have a Jersey shore restaurant. I know the small beach towns swell in size and the boardwalk restaurants become crazy busy during the summer months. Thanks for your comment! I’m not sure I have a favorite since it depends what I’m in the mood for. Growing up we usually went out for Italian or Chinese. Hi Sandy. I like Chinese too. I guess I enjoy most cuisines. I can't cook Chinese well, though. My college roommate was of Chinese decent and she knew how to prepare many dishes, but we still ordered out back then. If we are in the mood for Chinese now, we go out to our favorite, local restaurant. Thanks for your comment! The recipe sounds delicious. Congrats on the release! Thank you Carrie. I hope you enjoy the hummus! Hi Tina, and congratulations on the book. Your series sounds like something I will really enjoy! I don't necessarily have a "favorite" cuisine, but I like foods with a lot of complexity. Spices are my friend. It doesn't need to be hot, just not bland or one-dimensional. Also, while not vegetarian, I find myself a lot less into meat than I used to be, so I want my food to have plenty of vegetables. So in light of those preferences, I often find myself drawn to Thai, Indian, Caribbean, Szechuan Chinese, and Cajun cooking. Hi Susan. I think spices are the best! I don't like too spicy either. I could never handle hot wings or anything like that. Vegetarian is healthy, and we are eating less meat these days. I've been making soups this winter. I'm going to try a lentil and swiss chard soup tonight. Wish me luck! The book and the series sound great. I'm not sure that I have a favorite cuisine either. There are so many flavors to try. But this conversation reminds me that the menu has been pretty boring lately around here. Thai for dinner is very appealing. Hi Christine! Thai for dinner sounds good. Are you cooking it our going out? I'd like to say that I'm cooking but it will be take-out. Hi Shari! That sounds good. I also love a tasty, juicy cheeseburger. Who can resist that? I'm an adventurous eater and an adventurous cook. (Way too adventurous, my hubby would say...) And I love Middle Eastern food. Yotam Ottolenghi's books take up half the stack on my kitchen counter. I certainly agree that homemade hummus is so much better than store bought. I've made it, but the proportions are slightly different in every recipe and I can't wait to try yours! Hi Deborah. You sound like me! I have stacks of cooking books. My husband is always trying to rearrange them (poor guy) to make space. He won't win. My friends and family usually add to the stack every Christmas. I hope you enjoy the hummus recipe! I LOVE Middle Eastern/Mediterranean - basically any cuisine from the former Ottoman Empire. Just reading about your family restaurant and the homemade hummus is making my stomach growl, and it's only 10:30am. I confess I may get HUMMUS AND HOMICIDE for the recipes alone! Hi Julia! Thanks for the lovely comments. I hope you enjoy the story and the recipes! Congrats, Tina! I love this so much! Your setting and titles and the premise of the series are brilliant. (I'm from CT and have been to Ocean City several times - I love it there). I can't wait to read your book. Thank you so much for sharing your recipe, one question, how long does hummus keep? I've never made it before and am curious. My daughter is the Mediterranean food person in our family. I can't wait to pass along the humus recipe to her. I don't know that I have one favorite. I do love pasta, so Italian dishes are high on my list, but with stomach issues, that's not always a great choice because of the sauces. I also love a good sandwich, from hamburger to a chicken paninis. I've actually been told by my doctor that the Mediterranean diet would be better for me. I'm working on it. Tina, congratulations on your new series. It sounds like great fun. You've made me want to know more about the Jersey shore. I love reading about places I haven't read about before or places I haven't been. Hi Kathy. A Mediterranean diet is healthy. Lots of olive oil, garlic, and onions. It gives you killer breath, though! I also love pasta and Italian, but I've been trying to limit the carbs. But there are plenty of other Italian options I enjoy. I hope your daughter enjoys the hummus. Thanks for your comments! I love all kinds of ethnic food and think my favorites are Tex-Mex, Japanese and Korean. We live in Colorado and are lucky enough to live by a wonderful Tex-Mex restaurant that serves amazing chimichangas, which are my favorite. I also love sushi and have actually made it before with my good friend from Korea, Kim. It's a bit labor intensive when you start out, but then it gets easier, and of course tastes wonderful. Kim also introduced me to Korean Barbeque and Korean food, and I love the way they serve it up in Korean restaurants as well as their hospitality -- if you tell them you really like something, they'll bring you more! Thanks for visiting Jungle Reds and congratulations on the upcoming release of Hummus and Homicide, it has such a great title as do your other upcoming books. I look forward to reading them all! Hi Tina. I love a good cozy and your series sounds wonderful! I'm not much of a cook but I'm Polish and once a year I get together with my sister and cousins to make hundreds of pierogi! We'll split them up, freeze them, and enjoy them for months. We are Team Pierogi! I can't wait to read this. The Jersey Shore, good food, and a mystery is the perfect combo for this Jersey Girl. Congratulations on the new series! Hi Dianne. My brother-in-law is Polish and once a year he makes kielbasa from scratch. It's a time consuming process, but it's delicious when it's done. I also enjoy pierogi! Thanks for the kind words about the book. Tina! So great to see you here… I loved chatting with you at the New Jersey meeting! What a thrill to see this come to life. So incredibly exciting! And I will confess that although I love, and experimenting with phone, I have never had a grape leaf wrap. I have been offered them, thousands of times, and somehow, can’t quite figure out why they would be good. Why do you think this is? Maybe I need an intervention :-)? Hi Hank! Thank you for having me on your great blog. I loved your presentation at the NJ meeting! You made me laugh about the grape leaves. My mother-in-law won't eat them either. But trust me, they are good! Even my kids love them. You need to go to a good Mediterranean restaurant where they are prepared fresh and try one. They can be served cold with rice, or hot with rice and meat. They are two different types of dishes. It took me a while to try sushi, something about a seaweed wrap put me off, but now I love it. Thanks again! Hank -- I also recommend seeing if there's a Greek Orthodox church near you and if so, do they have an annual festival? I've had good grape leaf wraps in restaurants, but the best ever have been out of the kitchen of our local Greek Orthodox church during their annual festival. I'll bet that would be true in other communities, too! Hi Susan. Good idea to go to a Greek festival. We have a local one I attend every year and the food is great. You can try almost everything Greek. Thanks for the tip! Oh, thank you so much for the advice! And somehow, a hot one sounds potentially better than a cold one. Tina, maybe your mother and I can take the next step about these together! Hi Lucy and Hank! Yes, I like the hot grape leaves with meat and rice the best. Trust me, it doesn't taste like what you think a grape leaf would. Thanks again for inviting me on the blog! Tina, I will definitely look for your book (if I'm not lucky enough to win it. Although I have lived in California for years, I grew up in the Philly suburbs, and we went to "the shore" at Ocean City many times--I miss it! My favorite cuisine is Mexican (which I never tasted in Philadelphia), but I'm picky about the restaurants where I eat it, and I sometimes make it at home. Hmmm, lamb tostadas tonight? Hi Margie. Lamb tostadas sounds interesting and good. I say go for it! We live about an hour from Ocean City now and visit in the summer. California has all types of wonderful food, especially Mexican. Enjoy! Hi! My best friend from high school is Indian and I was in her three-day wedding. It was a fantastic experience. I enjoy Indian food, as long as it's not too spicy. I can't handle too spicy. I've never been to Andre's in NYC. I'll have to add it to my list. Thanks! I have this one on pre-order, so cannot wait for it to arrive. Not sure why I pre-ordered it, but sure glad I did after reading this. Thanks so much for pre-ordering Kay! Let me know if you enjoy the book. Yum! Making me hungry as I can almost smell those wonderful foods. But, you had me at the Jersey Shore so now I can't wait! Thank you Judi. The Jersey shore was fun to write about. One of my favorite vacation spots we can drive to with the kids. Congratulations on the book Tina, and here's to their success! I am not much for food exploration. I stick to the basic dead animal and a potato for my sit down type of meals. So yes, a burger and french fries would probably be my favorite "cuisine". This might seem odd since I used to love watching all the cooking shows back when The Food Network featured that kind of programming rather than contest shows. I love watching the preparation of foods, but invariably the cook/chef would put some ingredient in the dish that would automatically disqualify me from eating it. And while I worship at the altar of Julia Child's The French Chef TV show, I'd never eat that stuff either. But when it comes to plain, bland and basic tried and true foods like burgers, pizzas, subs etc., sign me up. I know that my diet will likely kill me sooner rather than later but at least I'll die on a full stomach. Heck, at one point I could tell when a certain sub shop I used to patronize (before they gave me food poisoning twice...five years apart) changed the type of ham on their subs just by the taste of the ham. Hi Jay. I used to love watching the Food Network cooking shows too, not the contest ones. Sigh. I wish they'd bring them back. I live a stone's throw from Philadelphia where they make the best "hoagies." I never knew "hoagie" was a Philly term, until I met my husband who is not from the Philadelphia area. He politely informed me it was a sub. I still stick with hoagie, and an Italian hoagie with oil and vinegar, not mayonnaise, is my absolute favorite comfort food. Thanks for the comment! Tina, your book sounds great, and it's making me crave stuffed grape leaves. Hank, you've got to try them! They're delicious! I love all cuisines with the exception of Indian because I can't tolerate the spice and the heat. I look forward to trying your hummus recipe! Hi Ingrid. I'm not a fan of too spicy hot either. I hope you like the hummus recipe! I like all kinds of food. We used to have a relative in Ocean City so were visiting most springs and falls. I really like Ocean City and Cape May. Hi Sally. Cape May is lovely. I included a scene at a Victorian home in "Hummus and Homicide." I love the lighthouse and plan to take my kids there this summer. You can see for miles and it's very pretty. Hi Tina! Loved reading about your new series. As for food. . . I can't pick just one. I like fresh seafood. I like Creole cuisine from my time living in Louisiana. I love real barbecue and Tex-Mex from living in Texas. Southern food. Pierogies from when we lived in Ohio. Hi Pat. Louisiana has wonderful, flavorful cuisine! I'm jealous. I like a good barbecue too, although I haven't made my own sauce. That will be on my list. Shalom, Tina. Congratulations of the book. I grew up in a beach community of New York City, Rockaway Beach. It's a peninsula on the southern shore of Long Island between Jamaica Bay and the Atlantic Ocean on it's south shore. I remember in particular in middle school when I and a friend would cut class and find ourselves a spot under the boardwalk, during those months when no one else was at the beach. I understand that now, surfers chasing waves are there, year round. In my late twenties and early thirties, I had a friend who I worked with who was from Kerala, the Indian Province in the south and on the western coast. He introduced me to Indian food. I never tried cooking it but I visited a surfeit of Indian restaurants in New York and then Philadelphia. I always ordered the mildest of spiciness but I did have to bring a towel to mop the sweat that poured from the top of my head. I loved it. However, I haven't been to an Indian restaurant in much too long a time. Shalom David! I've heard of Rockaway Beach. I haven't been. It's a long drive from Southern NJ. It must have been nice to sit under the boardwalk with your friend back then. I do enjoy Indian food, and I haven't been to an Indian restaurant in a while as well. Maybe it's time we both went. Thanks for commenting! This definitely makes me want hummus. I'm looking forward to reading it! Congrats, Tina! Thanks for the kind words Cari! I might be a bit biased since my grandfather was born in Lebanon but Middle Eastern food rules, with Italian as a close second. Grape leaves are a favorite and I recently featured a family recipe for Maamoul cookies in my bakery mystery series. Best of luck with your new book, Tina! Hi Catherine. I'll have to check out your family Maamoul cookie recipe and your bakery series! Thanks!